With a new skeleton, a brick house on the outskirts of Washington, D.C., gets an eco-friendly upgrade—without losing its local charm. 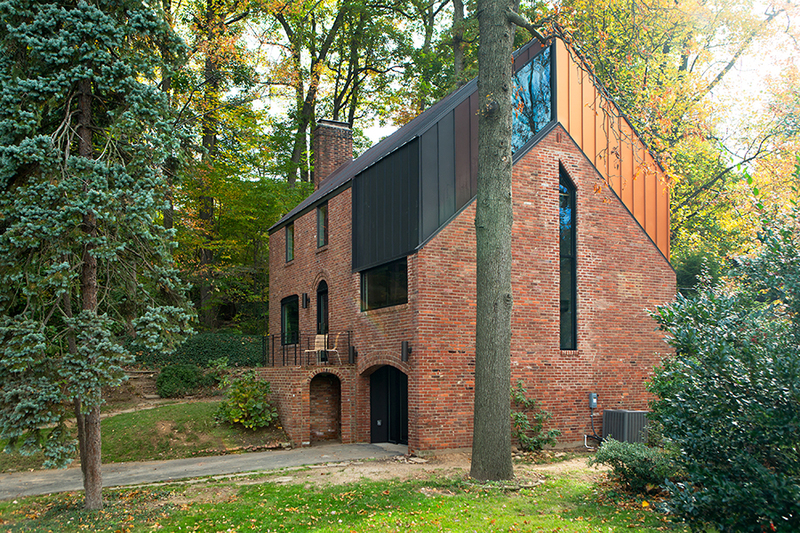 In Arlington, Virginia, a drafty house was made more than twice as efficient with the addition of metal both inside and out. Roof panels topping the brick envelope echo its original geometry. "Brick is such a strong load-bearing material, we wanted to emphasize its strength," Paola Amodeo says of the new design. The den, originally and enclosed porch off the back of the house, was one of the biggest energy-sucking culprits. The designers opened it to the rest of the house to improve circulation, added a pentagonal Weather Shield window, and clad the structure in metal panels matching the roof. Like the exterior, the open-plan living area combines reclaimed materials, including the pre-existing black walnut floors. Industrial finishes include Viroc cement fiber panels over the fireplace. “Our house was of no architectural interest,” says Martha Conboy of her Arlington, Virginia, home, “just a modest Colonial that we never really liked.” Martha, an independent producer and writer, and her husband, Rob Senty, a veteran of the United States Environmental Protection Agency, had spent 30 years living in the redbrick home when they decided to do an energy audit. The results revealed the house was a “sieve” that would require $80,000 to make energy-efficient. In the neighborhood, drafty 20th-century structures are often razed and replaced by “enormous Craftsmen-on-steroids,” something Martha and Rob didn’t want to do. As it turns out, they just needed to look to their backyard, where architecture firm Paolasquare had renovated their friends’ house, to find the solution. “I was in shock at how imaginative and innovative it was,” Martha says, “This was a little cottage, and they completely reconfigured and rethought it.” So Martha and Rob called in the “Paolas”— Paola Amodeo and Paola Lugli, who now practice as Paola One Design and Paola Lugli Architecture + Design, respectively—to retrofit their house.